One of the things we like to do when we’re relaxing between our various responsibilities is look at information. And sometimes it’s really a lot like unravelling Oogie Boogie from Nightmare Before Christmas. At a casual glance, Nina Ahmad looks… fine. She’s running a campaign for Lt. Gov. after initially taking aim at Bob Brady’s seat. She came to speak at a progressive event a few months ago, and spoke a really good game. She has the word PROGRESSIVE in bold, blue letters on the front page of her site. Ms. Ahmad’s website touts her experience as an immigrant and a lot of her talking points are based around being a woman of color in a white male dominated sphere. She used to be the Philly chapter president of National Organization for Women (NOW). But is someone a progressive just because they say they are? What does someone’s past really say about their future actions? Most recently, Ms. Ahmad was the Deputy Mayor for Public Engagement for Philly. She resigned to run for Brady’s seat. But after switching to Lt. Gov., we wanted to dig a little deeper. First of all, it’s important to know that the Lt. Gov. serves as the President of the State Senate. This means they are responsible for how the Senate’s decisions are made and going to social events. She claims to be ready to take down the democratic machine in Philadelphia and is running as an “outsider”. That is nothing more than posturing- being the former president of NOW, while admirable, does not make you a progressive. As to being an outsider, she used to work for Mayor Kenney and asked Tom Wolf’s office for their advice before switching to the Lt. Gov. race. It seems strange that an outsider would be able to just ask for advice from insiders. 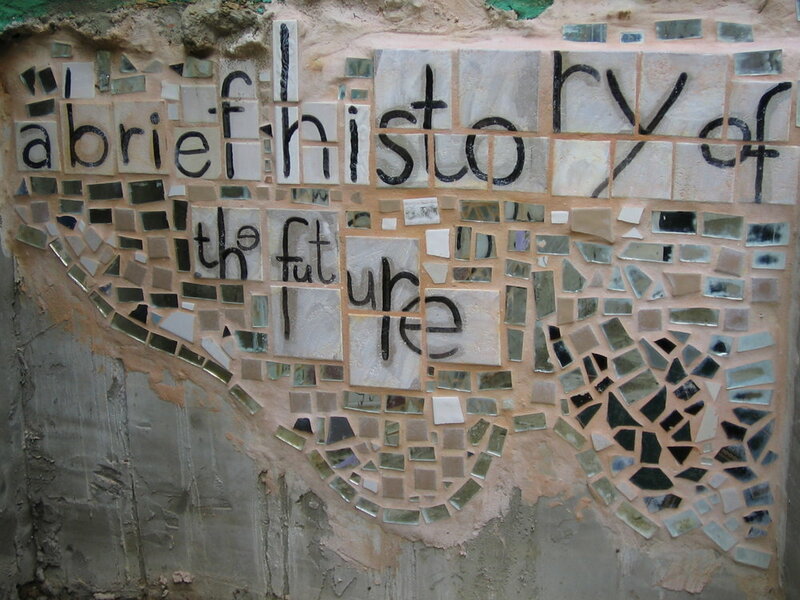 We have more control over the future than we think. But one of the most critical issues is that Nina Ahmad and her husband, Ahsan M. Nasratullah, are co-founders of JNA Capital, Inc., which “sources debt and equity for real estate projects, both for its own account and for a select group of developers/non-profit sponsors in the Philadelphia area.” They are basically a firm that supports and helps to fund projects that are directly linked to expansion projects around university campuses; one of the single biggest drivers in the gentrification fight happening in Philadelphia right now. Ms. Ahmad is also an alum of the University of Pennsylvania, a known heavy-hitter in the gentrification and displacement in Philadelphia. Interestingly, JNA Capital has contracts with UPenn to develop and lease the 3939 Chestnut St. building as an anchor point for their 40th St. Development project, to the tune of $17,000,000. Nina Ahmad, her husband, and their company are set to personally benefit if something big like the Amazon HQ2 were to come to Philadelphia. The further increase in luxury lofts and NoLibs style hipster-fication will personally benefit them. One element of this kind of hyper-gentrification found in cities around the world is the empty condo problem. While middle class workers like teachers and government employees are left sleeping in their cars in homeless encampments because of the ridiculous housing rates, there are apartments left vacant. They are usually owned by wealthy overseas nationals, some of whom have received visas through the EB-5 program. This program essentially allows very wealthy foreign nationals to buy their residency in the U.S. There is a lot of intersection between large scale “luxury” development and people seeking EB-5 visas. Screenshot from cached image from GCRC. Nasratullah (Ms. Ahmad’s husband) is the CEO of the Global City Regional Center which finances real estate development through the EB-5 program. 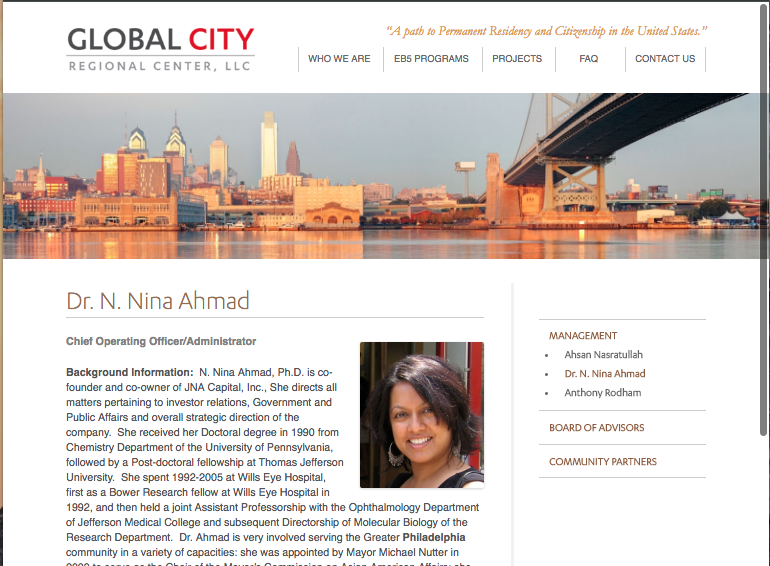 Nina Ahmad is previously listed as the COO of the EB-5 Global City Regional Center, although her name was removed sometime in 2016. To summarize, Ms. Ahmad and her husband own two companies that will directly benefit from Seattle/SF style hyper-gentrification in Philadelphia. Were she to win the Lt. Gov. position, she would be in a key position to make or break bills going through the State senate that would support such projects or support pursuing projects like the Amazon HQ2 or the Apple, Inc. headquarters. Another member of the Global City Regional Center team is Anthony Rodham… Hillary Rodham Clinton’s brother. His profile has been removed from the page, but this cached image verifies his involvement with the project. Anthony Rodham is currently being sued for fraud for $17 million in a case that alleges he misled EB-5 investors from China. Pennsylvania voters beware- there are neoliberal wolves in progressive sheep’s clothing running on platforms based entirely on identity politics, but who have no background or track record to support their claims or progressive ideology. Nina Ahmad has bold statements about defeating the Trump agenda, when she and her husband have made their personal wealth off of exactly the same global real estate game that the Trump and Kushner families have. It is vital, more than ever, that we take some hard looks at the past actions and associations of political candidates.